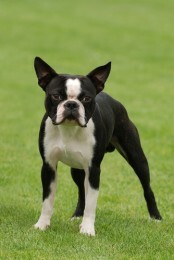 COLOR(S): Black, brindle, seal, with white markings on muzzle, between eyes, and chest. Possible white markings on legs. The American Eskimo is in the Spitz family (Nordic Breed), descending from European breeds like the German Spitz, the White Keeshond, the White Pomeranian, and the Volpino Italiano. They are bred as companions. Their face, coat and lush tail are Spitz-type and they have a pointed muzzle and erect ears. Nicknamed the "Eskie" they have been bred to be a house dog, companion and watch dog. American Eskimos are wonderful with their human family including children, as long as they are near their family they will be content. They enjoy cold weather better than warm. Known to clean their faces like cats they are easier to maintain than you may think, as their coat easily repels dirt and they have no doggie odor when clean. They have been used as a watchdog, as well as a circus performer. American Eskies come in three sizes: toy miniature, and standard. American Eskimos are affectionate, fun-loving, bright, obedient, alert, energetic, and intelligent but can also be independent and tenacious. They are loyal, outgoing, and eager to please with its friends and family but wary with strangers. The American Eskimo can be very clever and sometimes mischievous. They make excellent watchdogs, and are even quite good at guarding. They get along well with children and other animals. They are lively dogs that love the cold weather. They are the most biddable of the spitz breeds. They are also very clean, as they clean themselves like cats. Eskies are hardy and sturdy, and often long-lived. American Eskimos need to be brushed twice weekly and even more when shedding, they will also need to be bathed once a month. You will need to pay special attention to their teeth and nails. Hip dysplasia, PRA (Progressive Retinal Atrophy), elbow and knee degeneration and seizures. Larger American Eskimos will need a good jog or long walk daily. Miniature and Toy Eskies need only a short walk or lively romp. Early socialization and obedience is recommended. The Eskimo is intelligent and willing to please. They are highly adept at learning tricks. The Eskimo will not respond to harsh or heavy-handed methods. Training must be done with firmness, fairness, patience, and consistency.